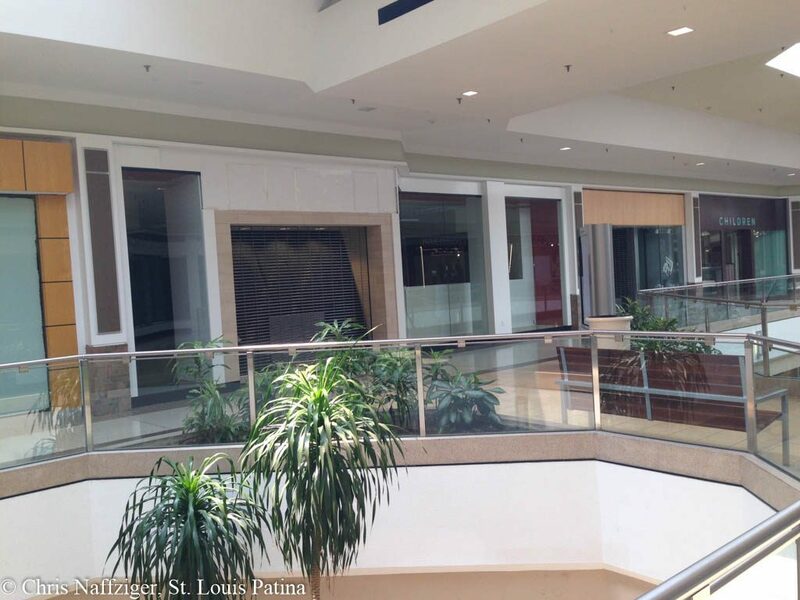 I never thought Chesterfield Mall would join the ranks of Crumby Run-Down Malls of St. Louis. 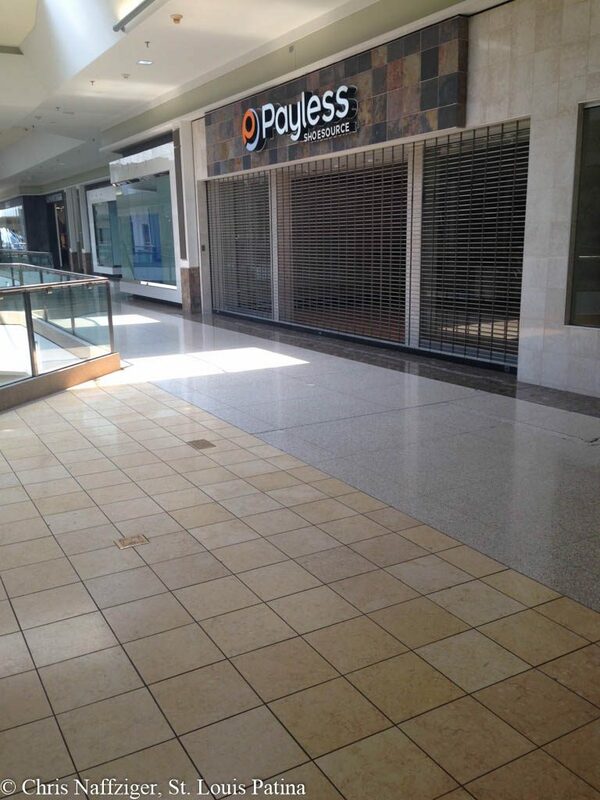 But it has, and despite surviving the Great Recession, was done in by the two new outlet malls further west. I used to love this mall, back in the 1990s before the cool 1970s style was ripped out. Those big stainless steel sculptures were amazing. Oh yeah, remember when Dillard’s flooded right before Black Friday? Well, you heard it here first: that store is NOT reopening. There is no evidence of any renovation going on–not even one dumpster. 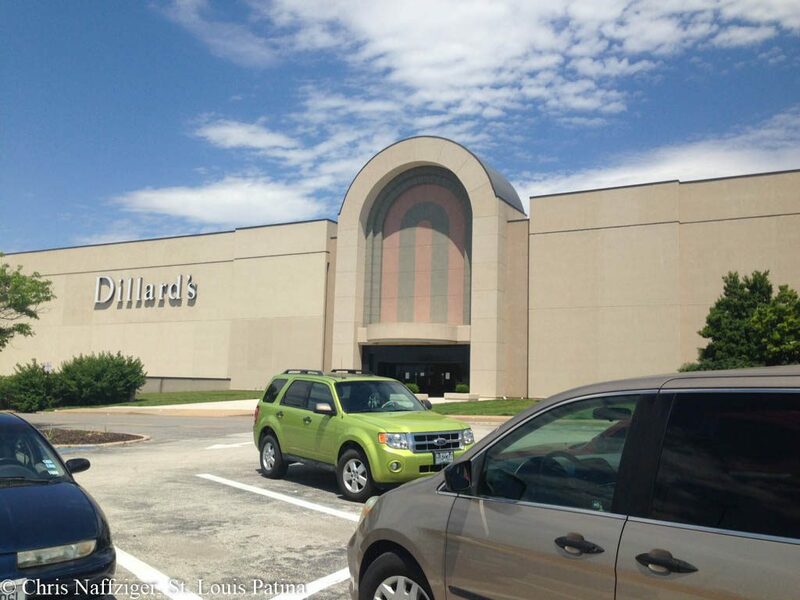 Update: Dillard’s did in fact announce several weeks after this post that the store would not reopen. I suspected that Dillard’s would not re-open in that mall after that water line broke and flooded the store. It was probably a smart business move just use the situation to gracefully exit the mall with no ugly “store closing” drama necessary. This breaks my heart. 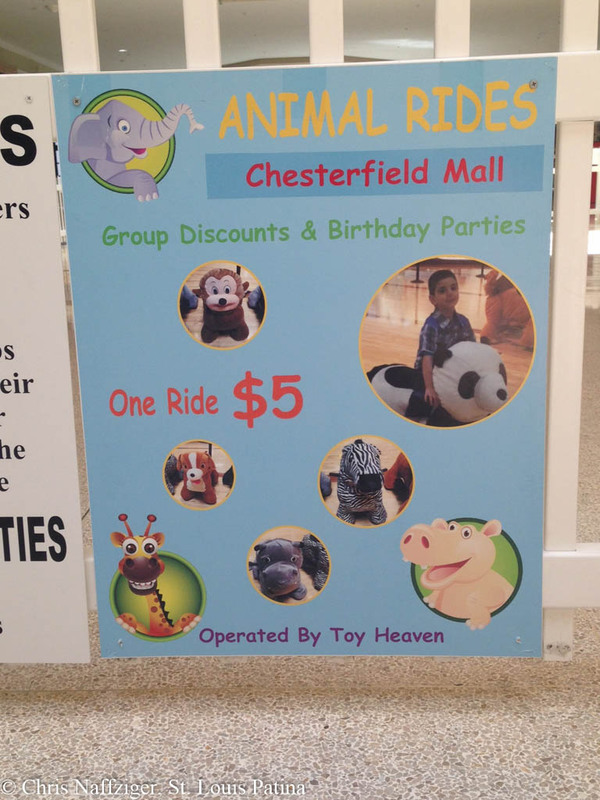 I worked at Chesterfield Mall for many years in the 1980-1990s. It was a great place back then. And I completely agree about the stainless steel sculptures. I spent a lot of time there even when I was off duty. In fact, it was the very first place that I took my son trick or treating. We employees always gave out candy to the kids on Halloween. But those days are gone. My son is grown and has a child of his own. The Waldenbooks where I worked closed down a long time. And the mall looks nothing like it did anymore. It’s sad. Do you have any picture of the mall from when your son was young? I was born in 1996 and the mall was a big part of my life. I always loved it. Do you remember how the old food court had birds flying *inside*? I agree with you. I worked at B. Dalton Books…this is so sad. I remember the hustle and bustle of Chesterfield Mall. I actually got choked up when I was there a few days ago. I grew up in the that mall. If you go to the upper level where Sears was (sad that closed, but it would have anyway) the mall had a mall recall contest, if you read mine (Tammie H.) it will bring tears to your eyes. I recall some really nostalgic stores. Thank you for the memories, Tammie! I spent a lot of my high school years in that mall, and I have lots of fond memories, as well. Do you happen to recall a German deli that was in the mall? I can’t remember the name, for the life of me. Was it Ruma’s? I remember their 20th anniversary celebration many, many years ago. There was another one next to Golde’s in Warson Woods. It was called Dunderbacks (not sure on the spelling). Loved that place. What wasthe name of the cookie store in Chesterfield Mall back in the 80’s? They were glazed then frosted and on a popsicle stick.? 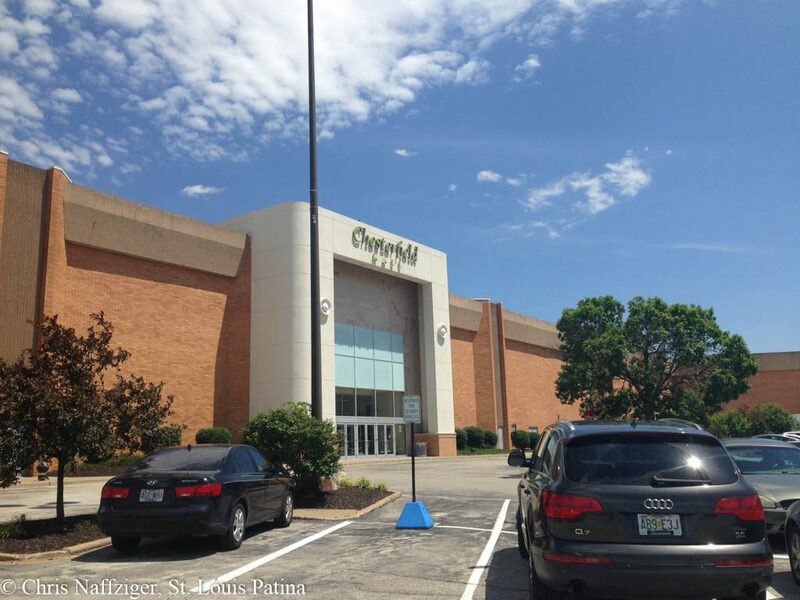 Wow, Patti, you stumped me on that one, and I spent a lot of time at Chesterfield Mall back in the 1980s! It was called The Cookie Factory. Remember at the corner of the store, you could see the oven turning as the cookies baked. It was always a treat getting a snack from there. There was a Kula’s Bakery in Warson Woods next to Goldie’s. Don’t know about Chesterfield Mall. Oh, was that called Kula’s? Thank you for the correction! I remember there was a table top arcade game with Pac Man or another early 1980s classic.